“A united Democratic Party cannot be defeated,” Democratic candidate for governor Albert Bryan said. That was the message of Wednesdays’ gathering as former Democratic candidates for governor, Angel Dawson and Allie Petrus, officially pledged their support to Albert Bryan to face Governor Mapp this fall. 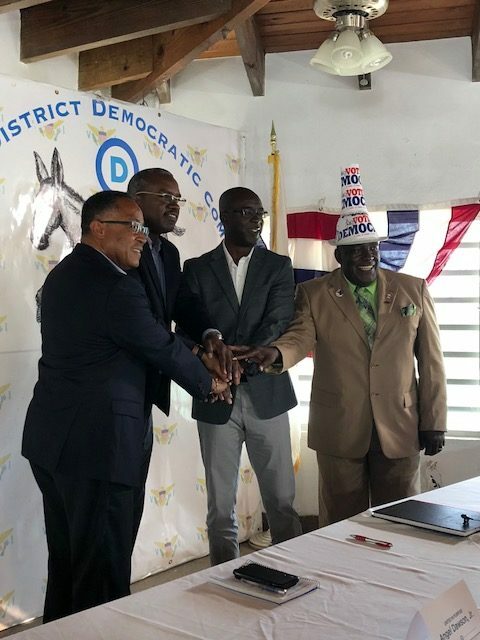 “And the pledge of my campaign and our campaign workers to support the Bryan Roach team so that you will be successful in running that first leg to restore the Virgin Islands to all that we know it can be,” Dawson said. It was all hugs and handshakes for these three men who just days ago were on the opposite team. They say its’ lessons from the mainland that show them the importance of coming together. “I reflect on the last presidential election, when Bernie Sanders lost and his people were emotionally hurt. Emotionally distraught and wounded and they stayed home,” Petrus said. That message that hit home with people here. “We have to move forward and do something positive for our territory,” Randolph Bennett another voter said. Supporters of Petrus and Dawson vowed their support to Bryan. Others said that it’s refreshing to witness. “It’s lovely to feel the energy in here. And to see everyone embracing each other- I think its the first time I’ve seen it in years and I love it,” Albert Richardson from St. Thomas added.